I think many people nothing to do so they get online to find something fun, that is why some social network communities are so popular, such as Myspace, Youtube. But some people are also nothing to do online, so maybe this website is good for them. File Swap is a strange site that give you a black box that you never know what is before you got. 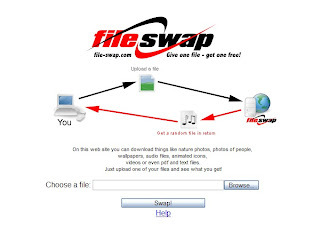 It like a game, you upload one file ( picture, text file, audio ) to File Swap, and you can download one file free. Sounds like an exchange deal, but you will get nothing ( actually you got something you do not want ). File Swap called fun site, but I do not know what is fun with this game? It is waste time.